A lot of responses to the Wasp post, so we thought we’d add a small follow-up looking at some of the points raised. I do not believe it has never been scrutinized. I think I read somewhere the type had been examined and it was genuine, can anyone confirm that? The original document has never been examined. We think a photocopy was looked at by someone qualified, who pronounced the typeface to be the same, but we’re not sure how much value can be attached to that under the circs. Back in 2003 I (KL) talked to the now late Melvin Harris, arch fraud-buster, who said the typeface would have to be examined under magnification for any worthwhile results. Any typeface experts out there who can confirm or refute that? Martin Gardner suggests that Carroll kept the galley proof because he may have wanted to do something else with it. That doesn’t make much sense, why would Carroll keep something of inferior quality? One thing we do know about Carroll is that he was very pernickety about the quality of the writing or photos he produced. And why keep this galley when no others were? Yes, this is one of the things that feels a bit ‘off’. If the rest of the Looking-Glass galleys had survived it might seem less strange. Why just this specific portion? You’d think LC would be more likely to preserve his original MS version rather than the galleys. But of course it’d be much harder to fake a handwritten MS. From the POV of a forger the galleys, with their small amounts of handwritten corrections would be ideal. Which of course doesn’t make them fake, but it does add to that slick of doubt. I have been reading the facsimile edition of Wasp in the Wig… Martin Gardner certainly seemed to have no shadow of a doubt about its authenticity. 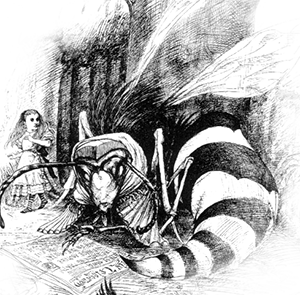 Something struck me as odd about the document; according to Gardner the Wasp was not a distinct chapter but occurs towards the end of chapter six, just before Alice becomes queen. If this is so why do the galley proofs only contain the apparently missing fragment without the links to the existing Looking-Glass chapter? Wouldn’t there be linking sentences to show where the chapter joined with the rest of the book? Ah, interesting. Anyone know of a reason why this point isn’t valid? You mentioned ‘Oath of a Freeman,’ is it worth mentioning then that Mark Hofmann arrived in the UK in 1973, a matter of months before the Wasp in the Wig made its first appearance? Goodness yes. Wonderful coincidence of timing. But he would have been too young, no? ~ by Contrariwise on June 24, 2010. I’m dense, but who is Mark Hoffman? ??? Not dense at all, merely uninformed (till now) in the specialised area of art/literary fraud. Mark Hofmann was probably the most brilliant forger in history – apart of course from all the ones who were so brilliant no-one even knows about them! His great period of productivity was from about 1980 to 1985, during which he began by specialising in forged documents purporting to come from the founding fathers of the Mormon church, and branched out into letters and unpublished literary works by the whole range of American political and literary leaders, from George Washington to Emily Dickinson. One method he tended in particular to follow was to fill lacunae in the historical record by producing documents known to have existed but long missing – hence my comment about the Wasp chapter fitting his MO. The Oath of a Freeman, an early colonists’ undertaking famous for being the first document ever printed in America (in 1639), was one such and probably his greatest and best-known work. His version passed all the tests thrown at it including carbon-dating, and the Library of Congress had agreed to buy it for $1m when Hofmann brought his career to a spectacular end by accidentally blowing up his car while on his way to murder one of his major clients. He survived the explosion and is now in Utah State Prison where he will remain until death. (Apologies to all Hofmann experts for this very partial and over-simplified summary). If you’re looking to find out more about Hofmann I recommend Simon Worrall’s book ‘The Poet and the Murderer’, which provides a good and very readable account of Hofmann’s career and a fascinating detective story of the hunt for the truth about one particular forgery, an Emily Dickinson poem. I believe there are other books about Hofmann which go into more biographical or technical detail but I haven’t read them. How funny would it be if Hofmann was the actual author of the Wasp. Trying to fake Lewis Carroll would be a huge challenge- he is hard to imitate. Still not sure if that would make it a good fake or a bad one. Did anyone see the X-Files episode – “Hollywood AD” that featured a barely fictionalised Hofmann character? A couple of little coincidental Carroll refs thrown in, almost as if David Duchovny (who wrote it) had got there before us. I remember that episode but had no idea it was based in any way on a real character. Nor do I remember any Carrollian references. Now I will have to watch it again! One of the top half-dozen episodes ever! Wasn’t the character actually called Hoffman? I never knew he was based on a real guy either. I know it’s hard to keep on track with all the agenda-driven weirdos trying to hijack the conversation – but I still wouldn’t mind an answer to my last posting on the Nohow thread. Yup, I think he was. Can you re-post your question? (Quote…) Let me get this straight. There’s all this material which undermines your own work – so you put it all on your website where it can undermine it at close range. But when you take it down, all the people who really hate your work won’t host the stuff that makes their case for them. online – I did read Rackin’s review of Karoline Leach’s book, but didn’t get anything out of it except that the guy needed his medication changed. I’m sure I once read an article about Leach criticism which had quite a bit to say about Rackin and some other reviewer, but I can’t find that now either. If someone has any idea what I’m talking about and can point me in the right direction that’d be great. Justin, hi. I think it may have been my commentary on the Rackin, Imholtz etc. reviews to which you refer; how very gratifying to think that somebody read it. I’m not sure why it is no longer online but I will willingly send you a copy by private email. If I am right in thinking that you are a member of the (sadly moribund) Lewis Carroll proboards forum I can get your email there (I’m an administrator, in case you were wondering) – if that’s a different Justin please let me know! This is a new blog dedicated to discussions and posts about Charles Lutwidge Dodgson, also known as Lewis Carroll.